Union Park Press, 9781934598160, 288pp. Faced with the never-simple task of feeding her busy family every night, food writer Leigh Belanger turned to her kitchen chalkboard, planning out her weekly dinner menus in order to keep the chaos at bay. She quickly discovered the merits of modern menu planning: it saves time and money, produces better dishes, cuts down on waste, and returns creativity to the kitchen. Most importantly, she found that a good plan preserves sanity. This stunning and approachable cookbook is an invaluable guide for families who want to eat locally and in season but know that getting dinner on the table requires a dash of reality. Sixteen seasonal menus lay out the strategy, starting with a "big cook" and clever tips on how to use that food in new and inventive dishes throughout the week. 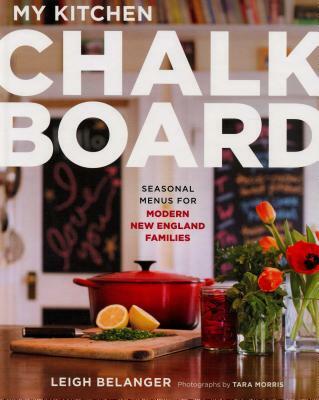 With over one hundred delicious and inspiring ideas for family meals, My Kitchen Chalkboard provides the wit, wisdom, and adaptable recipes you need to answer that nightly question: "What's for dinner? Leigh Belanger is a food writer, editor, and recipe developer who has been enthusiastically cooking since she was a teenager. She studied Gastronomy at Boston University and is the author of the Boston Homegrown Cookbook. Her writing and recipes have been featured in Culture magazine (where she was the food editor), the Boston Globe, Edible Boston, and other publications. She is the founder of Salt & Lemons, a kitchen coaching service designed to inspire and teach people to cook more at home. She lives and cooks in Boston with her husband and two boys.